Passions of Patchy may be off the beaten path, compared to mega music sites like Pandora and Spotify, but that in no way means the content is not as good. There may not be as much musical content as the afore named sites, but this is not just a musical site. Before you even scroll down to the music icons, there is a CLICKS icon for links, which take you to some very interesting sites, including a link to make your own license plate, then emailing it to someone, that is just one of many links. Six year old Del says the best way to have someone to fall in love with you is to tell them you own a bunch of candy stores. The section is broken down to 27 categories. Caution: It is addictive and time-consuming, once you start reading the jokes. TOUCH SOMEONE -This is the first of the music sections and includes Bette Midler’s Wind Beneath My Wings and the REM classic Everybody Hurts. Rock Around the Clock seems to be out-of-place on this page, but it really doesn’t matter when you can hear Johnny Mathis sing his standard Misty. The bottom row of icons is where you find most of the music on the page in jukebox format with list of songs to choose from. BLUES IN MY EYE JUKE JOINT – This page consists of three jukeboxes consisting of songs like I’ve Been Loving You Too Long sung by the late and great Etta James which reminds us again of how great of a singer she was. The jukebox also includes current singers like Susan Tedeschi, singing It Hurt So Bad. Jonny Lang has his clothes in his matchbox and is heard singing Matchbox, a driving blues number that really jumps. There is an option at the bottom of each jukebox to play all the songs in jukebox. A lot of the songs may not be recognizable, due to them being sung and played by some of the blues pioneers of the past. LOST IN THE 50’S AND DOO-WOP – Having grown up during this era, this is my favorite music on the entire website. The Lost in the 50’s page has six jukeboxes, filled with the songs, that baby boomers like me grew up with. Hurt – Timi Yuro…..one of the most emotion packed songs ever. Lost in the 50’s…..this song takes me back to the 50’s, like no other song can do. Blue Velvet – Clovers….This is nothing like the Bobby Vinton version as it gets the full doo wop treatment. A Thousand Miles Away – Heartbeats….Doo wop music at its best. Earth Angel – Penguins….A classic doo wop song that will live on forever, as long as there is music. In The Still of the Night – Five Satins….This song was so well-known that it was included, as part of Ronnie Milsap’s song Lost in the 50’s. SATIN SMOOTHIES – Is next as you return to the home page where you find two jukeboxes, where you can find the songs my parents grew up with, plus some we remember as teenagers. These songs were the chart-toppers, before Bill Haley and the Comets and Elvis Presley changed music forever in the middle 50’s. Old Cape Cod – Patti Page….You will be very fortunate, if you can find a song like this being recorded today. Unforgettable – Nat King Cole….This has to be the best of Nat King Cole’s hits that has become a standard. In The Mood – Glenn Miller Orchestra…. When you think of the big band era, this is one of the first songs, that come to mind and it sad we lost Glenn Miller during the war. Lazy River – Mills Brothers….This was one of the premier groups of this era, who epitomized the music of the era. SUNRISE GOSPEL – This page has only one jukeboxes but will bring back memories, to those of us who grew up in church in the 40’s, 50’s and 60’s, plus some more recent songs. The artists are not listed, but that sounds a lot like Dolly Parton on Farther Along. Beyond the Sunset….song written by a blind person after a group of people were viewing a sunset together and thus the title of the song, since the blind writer said they looked beyond the sunset. The reading that goes with this song makes it even more special. Family Bible….Willie Nelson wrote this song, but sold the rights to it for only $50 to Claude Gray, the country music singer. Precious Memories….sang this at funeral once for a lady who attended our church. What a great thought to think of the precious memories, even though the loved one is gone. TWO STEPPIN’ JUKE BOX – Last but not least, Patchy’s Passion includes three jukeboxes for country music fans. Don’t Rock the Jukebox – Alan Jackson….This song really rocks out and tells the story of a man, who is too sad over his breakup with his girlfriend and doesn’t want to hear the Rolling Stones on the jukebox, but wants to hear George Jones instead. He Stopped Loving Her Today – George Jones….This song has been chosen as the best country music song ever, on many lists of Top 100 songs. Sweet Dreams – Patsy Cline…. also recorded by Tommy McLain of Pineville, Louisiana, who attended my high school in the 60’s. His recording of Sweet Dreams outsold Don Gibson, the writer of the song and the immortal Patsy Cline. His version went to No.15 on the Billboard chart. For the Good Times – Ray Price….Has it really been 42 years since Ray Price recorded this country classic? It is true and also it is true that Ray Price is still actively singing at the age of 86. The 2010’s started his eighth decade of being active in country music. You could spend hours at this website listening to the music and going to some of the links at the website. Most of all though it is all about the music. The Tropic Lightning patch represents the 25th Infantry Division and I wore that patch proudly from June of 1963 to May of 1966, when honorably discharged from the Army. I had re-enlisted in the regular Army in May of 1963, after having served six months of active duty with the Army Reserve. Left Alexandria, Louisiana on a bus in October of 1962, headed for Leesville, Louisiana and eventually the final destination of Fort Polk, Louisiana. One of the other recruits on the bus made a big mistake right off, after arriving at Fort Polk. He found out that yelling nutbrain at a sergeant, from a second story window was not acceptable behavior. That sergeant let him know in no uncertain terms, that that kind of behavior would not be tolerated from a soldier in the United States Army. We went from the brutal October heat of Fort Polk, to freezing temperatures, while on bivouac in December during basic training. Without giving the gruesome details of basic training, will move ahead to finishing basic and going home for Christmas. After Christmas I boarded a Missouri Pacific train in Alexandria, Louisiana for Indianapolis, Indiana and the ultimate destination of Fort Benjamin Harrison, where the Adjustant General’s School was located. When the train rolled into St. Louis, it was snowing and snow covered the ground. It was amazing to see snow for a 18 year-old kid who seldom saw snow in Louisiana. Later on the train arrived in Indianapolis and I took a taxi to the base. The ground was covered with several inches of snow, when I arrived. Learned that winter how brutal Indiana winters could be and even had a case of frostbite, while walking to a movie on base one night. School went well and graduated in April of 1963. After returning home and attending a few Army Reserve meetings, decided I would rather serve a full three-year enlistment, rather than go to Army Reserve meetings for several years. So in May of 1963 I re-enlisted for three years. I requested to be stationed in Germany or Hawaii and received orders for Hawaii. Boarded a plane for San Francisco and was helicoptered to the Oakland Army Terminal, where I would stay about eight days. Finally we boarded a MATS plane for Hawaii and if I remember correctly it took nine hours to make the flight to Hawaii. We headed to Schofield Barracks, after leaving the plane and wish I could remember my first impression after arriving there, but that was 49 years ago and can’t recall now. 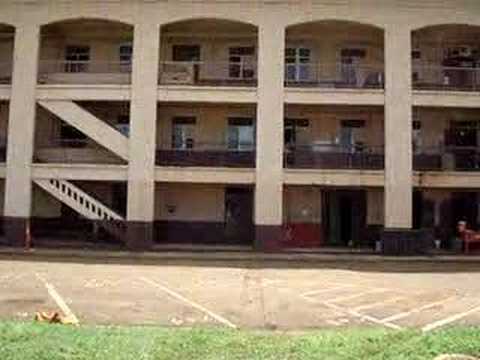 One of the things I do remember about Schofield Barracks were the quads, in which the soldiers were housed. The doors were left open at night, so each cot had a mosquito net to prevent mosquitoes, from ruining a night of sleep. James Jones was stationed at Schofield Barracks and when his book From Here To Eternity became a movie, scenes were filmed at Quad C of Schofield Barracks. This photo of a quad where the soldiers stayed reminds me of the quad, where I lived for about two and-a-half years at Schofield Barracks, Hawaii. Conroy Bowl an outdoor area holds many memories for me 49 years later, after seeing the Beach Boys in my first concert there. Saw the Christmas show with Hollywood entertainers, such as Julie Newmar and Stefanie Powers. It was a bittersweet experience though, hearing them sing Christmas songs while knowing I would be in Hawaii that Christmas. I can remember they held a Battle of the Bands at Conroy Bowl and band after band played Louie, Louie by the Kingsmen. I was sick of that song by the end of the night. Another highlight was Sue Thompson, known for Sad Movies Always Make Me Cry and Big Daddy’s Alabamy Bound shaking my hand, while singing the classic ballad You Belong To Me. A reminder of how long ago this was hit me, when I saw that she will be 86 on July 19. It would be 16 months after arriving, before I would make my first trip home to Louisiana in October of 1964. One of my favorite concerts at Conroy Bowl was when the Beach Boys entertained there, at the height of their popularity in the 60’s. Johnny Cash also appeared there, but seemed to be slurring his words, while singing and may have been still under the influence of drugs at this time in his life. Several years before my arrival in Hawaii, Elvis Presley appeared in concert there in his last concert appearance for many years, before being drafted. It was over ten years before he would appear in concert again, after completing the filming of over 30 movies. This website owned by Scotty Moore, who was with Elvis in the early days, shows many photos of Elvis at the Conroy Bowl. The website also tells how General John Schofield, who was a Union General in the Civil War foresaw the need, for the use of the Hawaiian Islands as a base to protect American interests. That was in 1872 which was 69 years before Pearl Harbor was attacked. Visiting the Arizona Memorial was one of the most memorable events while serving in at Schofield Barracks, Hawaii and will never forget reading the names of those who had died on the Arizona. Oil was still coming up from the Arizona in 1963. A night-time view of Waikiki Beach with Diamond Head seen in the background. Spent many a weekend day at Waianae beach looking across the ocean and knowing California was on the other side while listening to songs like Surfer Girl. Beyond the Reef, one of my favorite Hawaiian songs being played on a lap steel guitar. Mele Kalikamaka is Hawaii’s way to say Merry Christmas to you. Hawaii is usually thought of as a tropical paradise, but I found out different, when sent to the Big Island (Hilo) on temporary duty. I was assigned to a post office at the Pohakuloa Training Area that was at a high elevation. We could see snow capped mountains from the post office. 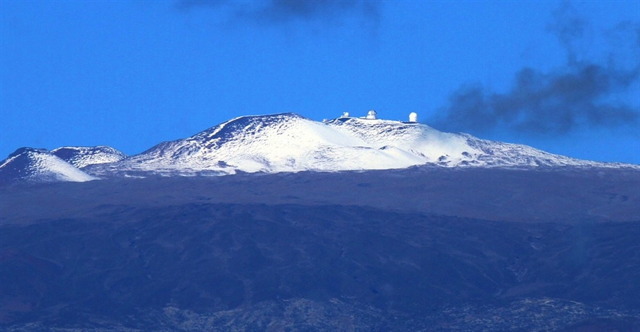 Snow can be seen atop the Mauna Kea Mountain on the Island of Hilo. All good things come to an end and my paid vacation to the tropical paradise of Hawaii came to a screeching halt when we received word, that our postal unit was being sent to Vietnam. This photo was taken the same day that we boarded the USNS General Walker to Vietnam on a voyage which would take 14 days traveling 500 miles a day, before we disembarked in Vietnam. I didn’t know the above photo even existed until today and was shocked to see it was a photo, of the 25th Infantry Division troops boarding the USNS General Walker, the same day that we boarded it. Once the ship was on the way to Vietnam, I couldn’t help but wonder how many aboard that ship would never make it back home alive. We had too much time to think on the long ride to Vietnam, about what fate held for us once we left the ship in Vietnam. We left one tropical paradise behind to go to another tropical paradise, that was a country 7,000 miles from Hawaii, in a country which offered only danger from a ruthless enemy, as we disembarked from the ship. I can remember how it took awhile to get used to being on land again, after two weeks of drifting across the ocean. I can remember the stifling heat of Vietnam and how I drank several Coca-Colas to keep from being dehydrated, almost immediately after leaving the ship. Hawaii was a distant memory, but 49 years later I think of the Hawaiian sunsets, the Hawaiian music and the musicians using their steel guitars to play songs like Beyond the Reef and My Little Grass Shack. I can remember going to the service club and being entertained by various entertainers including the cowboy star of many westerns Jimmy Wakely. I can remember like yesterday the beautiful sunsets on Waikiki Beach….the Service Club personnel taking on tourist excursions around the island seeing various attractions, that we may not have seen otherwise….the pecan twirls out of the vending machine at the service club….seeing the concerts at Conroy Bowl….the palm trees on the grounds of Schofield Barracks….working at the USARHAW post office and seeing the pro basketball player Terry Dischinger of Purdue and Detroit Pistons fame, who was working in the chemical department….working with the Hawaiians at the post office and how they freaked out when the temperature dipped to 59 degrees one day and showed up for work wearing jackets….remembering the day that JFK was assassinated, that I was substitute company mail clerk that day and listening to the news flash on the radio. I was the first to tell the company commander the news….also remember just missing seeing Lee Harvey Oswald shot by Jack Ruby on the television in the day room. General Weyand, then commander of III Corps in Vietnam, was the unidentified high-ranking officer, who told Apple and Fromson (reporting the same story for CBS) that “I’ve destroyed a single division three times . . . I’ve chased main-force units all over the country and the impact was zilch. I had often thought the war was not being fought conventionally. In past wars our military had swept across countries, instead of seeming to be going around in circles in Vietnam. However, that is just my opinion and others with more knowledge may be able to address that situation with more clarity. Sorry from straying from the Hawaiian theme, but the encounter with General Weyand reminded me of the Vietnam situation. I may never return to Hawaii again, because of the extremely high cost of being a tourist there, but it may be better that way, so I can remember it the way it was as those two years and eight months there were one of the happiest times of my life. I almost felt guilty being paid there, since it was such easy duty. Shindig was a show featuring many of the best known singers of that era, that was first televised on the ABC television network on September 16, 1964. The Beatles had started the British invasion, in February of 1964 and the show featured many British singers. The show featured regular singers like Bobby Sherman, Jackie DeShannon and Donna Loren and Teri Garr was one of the dancers and went to be a movie actress. Guest hosts on the show were a strange mix of Boris Karloff, Mickey Rooney, Zsa Zsa Gabor, Ed Wynn, Hugh O’Brian, Jackie Leonard and others, who were not known for their musical talent. This video features Herman’s Hermits singing I’m Into Something Good. The harmony from the background singers reminds me of the Beach Boys sound. The next song is Doo Wah Diddy sang by the Manfred Mann. Gerry and the Pacemakers close out the video with Don’t Let the Sun Catch You Crying, their signature hit. The Isley Brothers sing Shout in this video, that also features the Shindig dancers. Bobby Sherman singing the Frankie Ford hit Sea Cruise. Jackie DeShannon sings her hit song What the World Needs Now, which peaked at No.7 in 1965. Donna Loren singing Shakin’ All Over which also features the Shindig dancers. Bobby Vinton singing his classic Mr. Lonely. The Supremes singing Stop in the Name of Love. The Beach Boys singing Do You Wanna Dance. Patty Duke singing Say Something Funny, the only time I have ever seen her sing. The Temptations featuring David Ruffin sing My Girl. Shindig may have ended 46 years ago, but we can still enjoy the videos of the singers from those shows, that lets us go back in time. I had a little portable TV while in the Army in Hawaii and was able to see some of the Shindig shows. Ironically the show went off the air, about the same time that I was boarding a troop ship for Vietnam. It is just my opinion but the music of today doesn’t come close to the music of the middle 1960’s. Frankie Lymon and the Teenagers sing their first and most successful hit Why Do Fools Fall in Love on the Frankie Laine show in 1956. The Premiers, the original name used before they became The Teenagers were working on a song Why Do Birds Seem So Gay, when Frankie Lymon one of the members of the group decided to change the name, of the song to Why Do Fools Fall in Love. The song became their first single and peaked at No.6 on the pop charts, but was No.1 on the R&B charts. The group then became known as Frankie Lymon and the Teenagers. The group broke up the next year, as Lymon became a solo act. Lymon caused Alan Freed’s Big Beat television show to be canceled, when he was dancing with a white girl during a performance, which didn’t set well with television stations in the south. His records didn’t sell as well as his voice changed and he picked up a heroin habit at the age of 13. Lymon lost his record contract with Roulette in 1961. Then he was married for the first time in 1964, but his only child died two days after her birth. To compound matters, he had married his wife, while she was still married to her husband. He then married Zola Taylor of The Platters, but the marriage didn’t last long due to his drug habit. He then married his third wife in a three and-a-half year period in June of 1967. Lymon had not taken heroin for three years, before having a big promotion scheduled to help his career. However, he went back to heroin, to celebrate what he thought was going to be a return to fame. However the celebration didn’t last long, as he died of a heroin overdose on February 28, 1968 at his grandmother’s house. His legal problems followed him even in death, as all three lives tried to gain access to his estate. Part of the problem was that Lymon had never got around to divorcing his first two wives. His third wife Emira Eagle was finally awarded the right to Lymon’s estate. 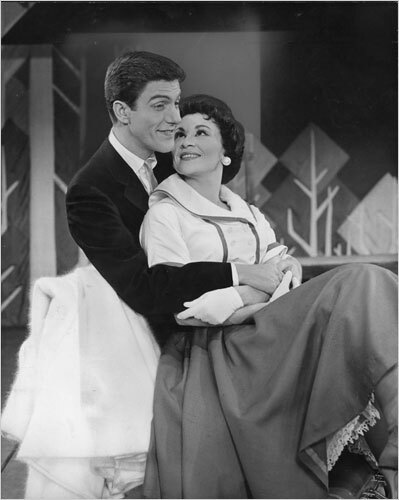 Lymon had never received a penny for co-writing Why Do Fools Fall in Love, but Emira Eagle did begin to receive royalties from the song. The following tribute shows his grave and tells about his influence on Motown music at Find A Grave website. 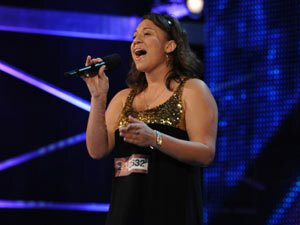 Chris Rene, Melanie Amaro and Josh Krajcik will vie to become the first winner of X-Factor in its inaugural season. The three singers will compete this week with the winner being announced on Thursday, Dec. 22. The best singer remaining in the running, for the coveted $5 million recording contract, in my estimation is Melanie Amaro. My personal favorite is Chris Rene, since he has overcome many obstacles, to be competing to be the winner of the X-Factor. Going from being a garbage collector with a serious drug problem, to the brink of winning a $5 million recording contract, makes me want to root for him. However, I expect to see either Josh Krajcik or Amaro take the top prize on Thursday night, on finale night. Krajcik has a powerful voice, but his mentor Nicole Scherzinger did nothing to change his stage persona or his appearance during the season. Rene changed his look during the season, due to L.A. Reid’s advice or did it on his own. Either way I think it increased his appeal. He commands the stage and seems to be enjoying entertaining the audience. Rene is by far the best entertainer, remaining in the running to win X-Factor. Krajcik looks as unkempt as he did during the auditions and has made no attempt to clean up his look. Who would want to buy an album of his with his look, unless he changes it this week? It is sad to see a singer with such a great voice, look like he bought his clothes at a Goodwill store, with scraggly looking hair, that looks like it hasn’t encountered a brush or comb in months. I apologize to his fans for my criticism, but am only pointing this out, to say that a singer’s appearance is crucial to their success. I look for Steve Jones to announce Amaro, as the winner on Thursday night. I still can’t believe that Simon Cowell chose four other female singers ahead of her. Speaking of Jones, there are rumors that he will not return for the second season. He is opposite of Ryan Seacrest who seems to run a tighter ship, without all the drama. Jones has several times asked questions to singers or judges, that were emotionally distraught and refused to talk to him. Jones seems to be obviously reading from a cue card, during X-Factor. I can’t see X-Factor bringing him back and will find a host, who is less annoying. The most shocking elimination this season was when Rachel Crow was sent home, due to Scherzinger not being able to make a choice between Marcus Canty and Crow. The judges are paid to judge and her refusal to judge, resulted in Crow going home, since it was her only chance, to remain on the show. Drew seemed to be a lock for the final three along with Crow, but Cowell’s insistence on her singing in a chair, for an entire song resulted in her being voted off the show. The animosity between Cowell and Reid speeded up Drew’s departure from the show. Summary of first season as of today: My personal opinion is that X-Factor went overboard, on the big production numbers. I can’t remember this many big production numbers, on American Idol. Their focus was more on the singers and not the staging of the songs. X-Factor did well in the ratings, but didn’t come close to approaching the ratings numbers for American Idol. I look for American Idol to continue draw more than 20 million viewers in its 2012 season. Cowell had predicted 20 million viewers for X-Factor, but was 9 to 10 million off most of the season. Jones, the host was a major distraction during the inaugural season. Know he was being hurried by producers, but then those same producers slowed down the show, by the dead air when announcing who was staying on the show. X-Factor did alright for a first season, but it seems like they could have come up, with a better final three, than that competing on Thursday night for the big prize. The fighting between the mentors, took the focus off the singers and onto the judges. Cowell and Reed were particularly disrespectful to the singers, in the other mentor’s tutelage. One of the singers will have a $5 million recording contract, after the show on Thursday night. Amaro to me, has the best chance of becoming a recording star. Melanie Amaro, who was given a second chance by Simon Cowell advances to final 12 last night on the U.S. version of X-Factor on FOX. Simon Cowell made a colossal mistake, by sending Melanie Amaro home, during the week the singers sang, at the homes of the judges. How he could send Melanie home, before Tiah Tolliver and Simone Battle was puzzling to say the least, especially considering that Simone had not forgotten a few words from her song at boot camp, but the entire song. To his credit, Simon did reconsider and went to Florida to tell Melanie, that she was back in the competition. Melanie in my opinion, was the best singer among the 17 acts that sang last night. By the time the show was over last night, Simon had sent Tiah Tolliver and Simone Battle home. Drew Ryniewicz who will also be in the final three girls, will be known as Drew for the rest of the season. Rachel Crow sang well and was her usual cute self, insuring her inclusion in the top three girls. Phillip Lomax was sent home, leaving Brian “Astro” Bradley, Chris Rene and Marcus Canty, as the three remaining boys in the competition. Personally, I liked Phillip singing Frank Sinatra music, but L.A. Reid seemed to be more interested, in singers that sing more current music. Astro did an excellent job in his rap song and he and Marcus Canty were clearly the best boys singers last night. I wouldn’t be surprised to see Chris Rene in danger of going home next week. L.A. Reid must not be a country music fan, as he sent home Skyelor Anderson and Tim Cifers after the auditions at the home of L.A. Reid. Lomax was my favorite singer coming into last night’s show, since he sings the music from my generation. L.A. clearly favors rap over the other music genres. Paula Abdul made the right choice by sending the Brewer Boys home. The Stereo Hoggz should have an excellent chance, of being in the final four this season. Their version of Try a Little Tenderness, showed their versatily. The two groups that were thrown together InTENsity and Lakoda Rayne will return the next week with The Stereo Hoggz. The two new groups sang well, but not sure if they can outlast, the more polished, Stereo Hoggz which have what it takes, to go a long way this season. The Brewer Boys wouldn’t have won on the final show, so it was just as well, that they were sent home. Paula did an excellent job with the choreography. It was no surprise that Dexter Haygood was sent home during last night’s show. Nicole Scherzinger really liked Dexter but she knew he was not in the class of Josh Krajcik, who really needs a name change bad, possible shortening his name to Josh. Le Roy Bell and Stacy Francis are a combined 102 years old, but still were better than Dexter. Matter of fact, it seemed like Dexter was sort of confused, after being told he was going home. Josh is the best bet, to be the last over 30’s singer remaining later in the season. He may not be the best looking of the three remaining singers, but his voice really stands out from the others. The biggest difference between American Idol and X-Factor, were the production numbers during many of the songs. The music was too loud in some of the songs, overwhelming the singers, during some points in the songs. After all it is a singing competition, not a competition to vote on best production numbers. Another difference was the quibbling between the judges, on songs chosen by the other judges, assuming the songs were picked by the judges. L.A. Reid and Simon Cowell seemed to have their own personal vendetta going on between each other. It may have been genuine disagreement, but can’t help wonder, if the producers were trying, to create drama, to spark interest in the show. At one point Simon called Nicole and Paula Squiddley and Diddley, while on another occasion Simon praised Paula for her work with the groups. There was very little quibbling between the judges on American Idol and wonder how viewers perceive the bickering among judges on U.S. version of X-Factor. This is probably too early to make a list, but wouldn’t be surprised if these singers are the final four for the season. Kravitz probably will need a makeover, before the season is over. He has the voice to win, but he doesn’t look like a winner. Rachel Crow’s cuteness, might take her a long way, but she is no match, for the powerful voice of Melanie Amaro. X-Factor attracted ten percent more viewers than last week, in the first live show on Fox last night. 11.8 million viewers watched the show, which placed the show in fourth place for the night. The show still had stiff competition from CBS which drew 19 million viewers for NCIS and 15.9 million viewers for NCIS LA. Dancing With the Stars was the third most watched show last night with 13.8 million viewers. X-Factor should do better in coming weeks, as there should be no more scheduling shifts, due to the World Series, which probably affected the ratings. I think even Simon Cowell realizes that X-Factor will not come close, to drawing more viewers than American Idol, but he would like to see the numbers improve from where they are now.